The statements of Cross and the apostle Paul are at odds here. Paul says that if the who preaches a different what, he is to be accursed and not followed, and he includes himself and all his fellow holy apostles in that number. That even an apostle was capable of erring in this way is evidenced in Paul’s confrontation with the apostle Peter over the gospel (Gal 2.11-14). The standard of testing is the what delivered once and for all to the saints (Jude 3). Michael Brown is right. Reformed Protestants focus on what Paul, Jude, John and Peter were focused on – the truth; the apostles doctrine. The first church in Jerusalem focused on the apostles' doctrine. (Acts 2:42) Roman Catholics focus on the persons, the bishops, and their successors throughout history. What happened when the successors went to Arianism for a while and Athanasius was "against the world"? Athanasius writing to true believers, said, "they have the places (buildings, churches), but you have the faith." When the apostle says, in Galatians 1:9 “so now I say again”, he was saying “so now I say again, by writing this verse, . . . “ Here is basic Sola Scriptura teaching. “As we have said before” means both in his oral preaching and in verse 8. The writing is God speaking through the apostles. Paul expects the churches to understand his writings. The writings are all we have from the apostles. They are the what. The whos are exhorted to continue to hold to the what, the truth, to guard the deposit ( 2 Tim. 1:14), to remember the words of the prophets and apostles (2 Peter 3:2, Jude 17); to pay attention to the more sure prophetic word, the Scriptures. ( 2 Peter 1:19-21). Peter says nothing about any successors or bishops. He calls himself a fellow-elder. ( I Peter 5:1) If the Roman Catholic doctrines and dogmas of the papacy and apostolic succession were the truth, the great apostle Peter, the one who is allegedly the first Pope, would have said something about that in his writings, if it was so important. As it is, he emphasizes the truth, and the writings that believers will have to read after the apostles die, so that they can keep on holding on to the truth. Sort of cracks me up, how "what" is such a mess, and what is its point? To convey the supposed teachings of the "Who". No, not Townshend, Daltrey, Entwistle, and Moon, but that other megacelebrity of long ago, the damning, addled, you-know-who! Burk, is there some reason you come here beside the enjoyment you seem to derive from being pestilent? Do you really care what any of us think? Or are we just the poor benighted christians here for your amusment? Ken, this is a great post, and an excellent reminder. Thank you for this. You've deeply misrepresented the position I defended in my article. I'm not (and have never) creating a choice between who and what. Orthodoxy does not free float, disconnected from matter. Orthodoxy is located materially, sacramentally. You yourself have no what without a who. The orthodoxy of the second generation after the Apostles was not a who-less what; it was a what defined in terms of who brought it. That didn't change in the third generation or the fourth. The what always remained identified in relation to who, and still does to this day. I did not "deeply misrepresent" your position; I merely quoted part of Michael Brown's critique of your article and I agree with Michael Brown; and then I went on to make my own points based on Scripture. I understand your position about matter and sacraments and succession of ordination, etc. Your point about matter and form came after Michael Brown’s article. I was only focused on one thing at a time. I didn't say it was an either/or choice, but I did say it was a matter of focus and emphasis. Michael Brown is right. Reformed Protestants focus on what Paul, Jude, John and Peter were focused on – the truth; the apostles doctrine. The first church in Jerusalem focused on the apostles' doctrine. (Acts 2:42) Roman Catholics focus on the persons, the bishops, and their successors throughout history. We disagree with each other, but I did not misrepresent your position. We do have the "what" (the apostles doctrine), because we have the Scriptures. And we are grateful for the early church and history and copying of the Scriptures, and the fact that they have come to us through the centuries of history. Staupitz finally did what the RC church had drifted from (in emphasis); he actually pointed Luther to reading and studying and meditating on the Scriptures for his sin and guilt problem! Peter did not write to the believers about "follow my successor, who will be a Pope over all Christians, and by the way, about 1870 years later he will be declared infallible". Peter focused on his letter, the writing, the Scriptures. 2 Peter 1:12-21; with 3:1. Also 3:16 and his affirmation of all of Paul's writings. We are not either/or either; as we also believe in a plurality of elders/pastor-teachers who are to lead the local church and preach the gospel and teach sound doctrine. In fact, I never claimed such a thing, nor do I agree with that claim. You simply do not understand my position. What you have criticized is a straw man of my position. "The orthodoxy of the second generation after the Apostles was not a who-less what; it was a what defined in terms of who brought it." That still makes the "who" the more important thing, the definitional thing as you say. The "what" is defined by the "who". If it comes from Rome, it's orthodox; if it comes from someone else, it's not -- and all by virtue of who says it. Michael Brown's article is dead-on: elevating the who over the what is not "what" the apostles taught. That still makes the "who" the more important thing, the definitional thing as you say. The "what" is defined by the "who". Show me your who-less what, and then you'll have avoided the tu quoque. I didn't say there was a who-less what (this is starting to sound Dr. Suessian), nor did anyone else. I think the point is about which is more important, or more definitional, the what or the who. If your what is not who-less, then how is the who in your what less important than the who in my what? Those were actually Michael Brown's words. The emphasis of the RC position is in priority of order, (the apostle as a person first, then the doctrine), focus, emphasis, and on the persons (office of the bishop) of the successor to the apostles. I cannot comment on every thing you have written; I confess it is too long and too philosophical for me. I am still digesting your other articles, reading them over and over and looking up words that are not in my vocabulary. But I thank you for the education and being forced to think; I like that. However, give me the Scriptures and plain reason over scholasticism and philosophical mental gymnastics any day. Well, I believe there is a ground-level who and what that have been codified, as it were, in holy scripture and that is the very word of God that came through his Apostles and prophets. That is our deposit of faith once and for all delivered to the saints, assured to us by Christ and the Holy Spirit as he promised; and His promise is sure. From that point on, the who is evaluated in terms of the what. It is less important that it is the pope who says something, than it is what the pope says. As Paul said, even if he or an angel from heaven were to preach a different gospel, let them be accursed. So if the pope were to preach a different gospel, then the same applies. For you, on the other hand, as I understand you, the mere fact that it is the pope who says it would make it the gospel. That is how my who is less important than yours. From that point on, the who is evaluated in terms of the what. Yes! Louis, thank you for your contribution to the discussion! Well, I believe there is a ground-level who and what that have been codified, ... and His promise is sure. I agree with everything in that paragraph, so what you say in this paragraph can't be the point of difference between us. As Paul said, even if he or an angel from heaven were to preach a different gospel, let them be accursed. So if the pope were to preach a different gospel, then the same applies. Catholics agree. The false dilemma is that we have to choose between embracing a different gospel and God protecting the Church from doctrinal error. Ecclesial deism underlies that false dilemma. How do we determine what it the true gospel? As Christians have done from the beginning, we find the what through the who. Only those (notice the who) authorized by Christ could declare the gospel of Christ. And in the second generation, only those (notice the who) authorized by the Apostles could explain and interpret the gospel authoritatively for the Church. And the same was true in the third generation, and so on, organically. We start with the Apostles, and trace that succession forward, and follow what these authorized persons (the bishops of the Church) authoritatively teach about the what, showing us more explicitly over time the orthodox way of understanding the deposit of faith, and how it differs from the heretical way of understanding the deposit of faith. In that way, we always continue to find the what through the legitimate who. The possibility that some bishops fall into heresy does not nullify the authority of the Church to determine what is orthodoxy and what is heresy. Orthodoxy and heresy are not defined by our own interpretation of Scripture, but always authoritatively by the determination of the Church. Heretical bishops are heretical not because they disagree with our own interpretation of Scripture, but because they are teaching contrary to the dogma of the Church (who) in her understanding and interpretation of the deposit of faith (what). For you, on the other hand, as I understand you, the mere fact that it is the pope who says it would make it the gospel. No. The Pope has to teach in conformity with what has come before. Of course we believe that the Holy Spirit protects the successors of St. Peter from error as Vatican I explains. But we don't pretend that there has been no Church and no Holy Spirit at work in it for the last two-thousand years. We don't abstract away the last two-thousand years of the Holy Spirit at work in the Church, as though the Bible fell down from heaven yesterday. The what and the who can never be separated. The what does not float free, disconnected from matter; it is always found in and through a who, i.e. in the Church. Otherwise you have something like Mormonism, where the gospel is hidden for hundreds of years on buried plates in the ground. The proper understanding of the gospel has been delineated over time by the Holy Spirit working through the Church, just as the proper understanding of Trinity and Christology were established in the councils (*who*) of the first five centuries. The who defined the orthodox understanding of the what, as well as the identity and nature of the what. We wouldn't know the canon if it weren't for the Church. So again, the authoritative what comes to us only through the authorized who. You can't tell whether they are teaching another gospel (the what), if your criteria for determining this is simply whether they are, in your estimation, authorized persons (the who). In other words, it seems that you are still judging only by the who and not the what at all. You verify this again when you say: "how do we determine what is the true gospel?... we find the what through the who.... we start with the Apostles and trace the succession forward... in that way, we always continue to find the what through the legitimate who... heretical bishops are heretical... because they are teaching contrary to the... (who)." In light of these statements, I don't see how the article or the post mischaracterized your views. I think they represented them fairly. I also think they dealt with them adequately. However, I would like to add two thoughts. First, if you're looking for certainty, I'm not sure how you get it with your belief in an infallible succession. All you have to do is get the "who" wrong, something that you have to determine with your own private judgement to begin with, and every what that follows will be wrong. Permanently. Second, I can't help but think that anyone who followed your line of reasoning in the time of Christ would have surely crucified Him. The "authorized" persons were the priests that God appointed through Aaron. Who was this upstart from Nazareth? You would never have arrived at the what if you had been looking at the who. Dr. Clark’s position on this issue is certainly the more reasonable when the facts of history are examined; but in all fairness, I need to note that Dr. Clark’s position has been mine since the mid-80s. (Perhaps Ken remembers my previous labeling of “Reformed” Baptists as “Semi-Reformed”.) Anyway, I see little need to present further comments on this matter (the threads speak for themselves), except to introduce an important appendage: sola scriptura vs. nuda scriptura. It sure seems to me that Dr. Clark’s argument ultimately rests in the “classic” definition of sola scriptura, while despite protests to the contrary, James White’s argument has much more in common with nuda scriptura. And further, I would go on to argue that sola scriptura has important points of contact with the current “what plus who” principal, while those who insist on a “what” principle alone fall into the nuda scriptura camp. Me: I do not think that this helps much, for the Jews that accepted Jesus, accepted Him and His apostles as additional authoritative representatives of God the Father, and as such, as authoritative interpreters of the OT (who, also produced additional Scripture). The question that remains for those who have now embraced NT is: which interpretation(s) of the Scriptures is the correct one? 1. Beyond his holy word recorded in scripture by his prophets and apostles, God tells us to look first at the what, not the who. The correct who is the one teaching the correct what. 2. Looking first to the who does not solve the problem of private interpretation or uncertainty. There are competing who's out there, and you still have to make a personal judgement as to which to believe. 3. Using the criteria that RC's seem to use in determing the who --that is, historical succession, etc. -- one would have sided with the Jewish religious establishment against Christ. "Using the criteria that RC's seem to use in determing the who --that is, historical succession, etc. -- one would have sided with the Jewish religious establishment against Christ." You can't tell whether they are teaching another gospel (the what), if your criteria for determining this is simply whether they are, in your estimation, authorized persons (the who). I never said that was my only criterion. But the difficulty for those who use their own interpretation of Scripture to reject Church authority is that they can't tell whether they have rejected heretical Church authority or just made themselves into heretics. All you have to do is get the "who" wrong, something that you have to determine with your own private judgement to begin with, and every what that follows will be wrong. Permanently. Of course. If you're wrong about the Apostles being authoritative, then the NT is bunk. If you're wrong about Jesus being the Son of God, then the whole thing is a lie. But the possibility of getting the who wrong does not entail that the who can't be gotten right, and be known to be right once gotten. Your argument presumes (mistakenly) that the New Covenant charism can be no greater than the Old Covenant charism. The Church has always taught otherwise. Then we are agreed. One can get either the who or the what wrong. Your position provides you with no more certainty than mine. As for the rest, I'll leave the arguments where they lie. Jesus said, "I am the way, the truth and the life" So He replaced the what of doctrine with a who. The other what I see is the church. Sure that is made up of who's, the bishops and the pope. But Trent, like any eccumenical council, is trustworthy because it is the church. These men are not trustworthy for any other reason. But then the what of the church becomes a who. Because the church is the body of Christ. So the who ultinately is Jesus and the what is whatever He says. As for Gal 1:8,9. Paul clearly say if he taught another gospel. That is refering to somebody with some new revelation that is supposed to supercede the message of Jesus. Neither the Catholic or protestatnt side claim this. They both claim the gospel is the same. So the verse does not really apply. Interesting that you throw that dispute into a discussion that had nothing to do with this thread; and you seem to call careful exegesis "Naked Scripture" (Nuda Scriptura). I am very glad that we no longer have the harsh punishment / torture culture (for heresies, etc.) that we inherited from the Roman Catholic Church and the European Medieval Synthesis. The paedobaptists and credobaptists sometimes were persecuting each other at the beginning of the Reformation and for a time; but it is very encouraging that we no longer have that problem. We cannot see the Biblical Jesus who said, "I am the Way, the Truth and the Life" in the Roman Catholic Church because of all the false doctrines and statues of Mary and prayer to Mary and how Mary has eclipsed Jesus, and the statues to saints. Trent was not the church at all; they rejected the heart of the gospel for their own power and authority. The body of Christ metaphor meant that the members are supposed to love one another and exercise their various gifts to build up the body, and be light and share the light; it was never meant for the leaders to become dictators; and say that whatever say is what Christ says. So, once again, I believe Dr. Clark is quite right in his assessment of the so-called “Reformed Baptists”, for a truly Reformed tradition of the Church does not allow the members of one of the truly Reformed traditions to reject the Biblical and confessional doctrine of infant baptism; to do so moves one from the Reformed doctrine of sola scriptura into the realm of nuda scriptura. P.S. Forgive any grammar and spelling errors, I am in a hurry to hit the bike-trail before the rain starts. DW: "...to do so moves one from the Reformed doctrine of sola scriptura into the realm of nuda scriptura..."
This is such nuanced language, it sounds like a quasi-Romanist argument. 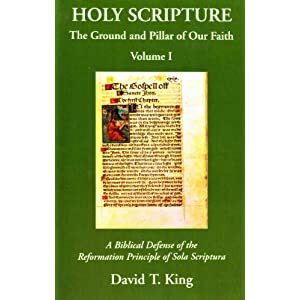 DW" "I would further argue that the Catholic doctrine of the material sufficiency of Scripture...is closer to the Reformed doctrine of sola scriptura..."
Baptists believe the Scriptures are the sole rule in all matters of faith and practice. We do not hold it as the only authority for each believer, as we have elders in our churches. David F.Wright, "One Baptism or Two? Reflections on the History of Baptism." So, the issue between Reformed Baptists and Presbyterians is a matter of exegesis more than the creeds and church authorities, which are secondary authorities, as Matthison points out. It might have been due to superstitious-legalistic reasons - the delusion that you should postpone your baptism as long as possible to get forgiven all the sins you had committed before the event - but it's well known that some of the most famous 4th century Christians waited until their adult age until being baptized. "Ambrose was known to be Catholic in belief, but also acceptable to Arians due to the charity shown in theological matters in this regard. At first he energetically refused the office, for which he was in no way prepared: Ambrose was neither baptized nor formally trained in theology. ... Within a week, Ambrose was baptized, ordained and duly installed as bishop of Milan." "Often it would take the threat of illness and death to convince Christian parents to baptize a child—such was almost the case with Augustine (born but not baptized in 354), though he recovered and Monica failed to follow through with the rite. Similarly, Jeremias observes others who failed to receive baptism as infants: Basil (born 330 but baptized at age twenty-seven); Ambrose (born 333 or 339 but baptized in 374); John Chrysostom (born 344/54 but baptized in 368/72); Jerome (born in the 340s, but baptized in 366); and Rufinus (born 345, but baptized at age twenty-five). All were raised with at least one Christian parent, Jeremias notices, yet each postponed baptism until adulthood."